How Off-Season Canary Molting Can Make Your Canary Sick. Canary Molting in Your Canary. Canary molting is not an illness but a normal annual occurrence. It is the process of your canary bird losing and then replacing his old worn out feathers with brand new ones. Humans lose old hairs and grow new ones on a daily basis--year round--but for canaries it all takes place in a 6 to 12 week period. The normal annual molt occurs naturally during the last half of summer and continues into the fall. It is common for pet bird owners to complain of off-season canary molting in December and January. This abnormal molt is usually caused by too many daylight hours being experienced by your canary. Your birds hormones and cycles are controlled by the amount of light entering through his eyes. When the days are at their longest, at mid-summer, his natural annual molt will begin. Other causes of an off-season molt are high stress...to much activity around his cage, high temperatures, high fluctuations in temperature, and fear. These high stress molts are called “shock molts”. If you've ever seen a cat try to catch a wild bird you probably saw feathers flying everywhere...even if the cat never actually touches the bird! This is an extreme example of how a canary can lose his feathers under stress. It's a matter of keeping your bird in excellent health. Canary molting is a time of high stress for your canary bird. It takes a lot of energy to replace all those feathers...roughly 2000 on a single bird! One molt per year is enough. And one of the problems with off-season molts is that they linger...they just drag on and on and your bird can end up sick as a dog. But at midwinter when days are at their shortest there should NOT be canary molting. And because humans like to have some lighting--even after the sun goes down--many pet canaries will suffer with an off-season molt. Even if you provide your canary with the perfect canary molting diet he might appear listless and will probably stop singing while molting. That’s normal. What’s NOT normal is a bird that is molting in late fall, winter, or spring. You can avoid an off-season molt by limiting your bird's daylight hours to 10 or less per day in the winter. Do this by covering his cage with a dark cloth at sundown and removing the cover at day break. This will give him the most natural amount of daylight hours throughout the year. Be sure to let him go through his normal annual molt in the late summer when days are long. Keep temperatures below 70 F degrees during the winter months. Some breeders report that they have outdoor aviaries where temperatures get down below 20 degrees and have had no problems. In the summer, as high as 90 degrees is OK...70 to 85 is best. Your canary bird is susceptible to other illnesses during a molt because of his weakened state. If you’re finding a lot of feathers around the cage, implement the above suggestions and feed your bird a good diet. Your canary’s diet during a molt should consist of high protein--feathers consist of 80-90% protein. You can also purchase molting food. It's high in protein and nutrients that your canary needs during a molt and any other stressful time. Canary molting supplements are available at The Canary Store. Other foods that might help are oily seeds like niger, flax, and millet to improve luster in new feathers. Daily cool-water baths and conditioning sprays will help your canary shed old feathers and keep new feathers clean. See...Clean Bird. Provide your canary with a safe, stress free, loving environment with the right amount of light and temperatures, and your canary will keep on S-I-N-G-I-N-G! 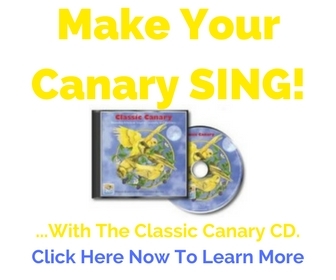 Keep in touch and sign up for the FREE Canary Tips Ezine. Learn more and sign up here.